In 12-inch skillet, cook beef and onions over medium-high heat 5 to 7 minutes, stirring frequently, until beef is thoroughly cooked; drain. Stir in tomatoes, chili beans and corn. Heat to boiling. Reduce heat to medium-low; simmer uncovered 20 minutes, stirring occasionally. Meanwhile, heat oven to 375°F. Unroll dough; separate at perforations into 12 breadsticks. Cut 4 of the breadsticks in half lengthwise; on ungreased cookie sheets, shape into 8 coils. Cut each remaining breadstick lengthwise into 3 strips, making 24 long strips. Cut each in half crosswise, making 48 short strips. Place 3 short strips on each side of each coil, placing ends under coil; pinch to attach. Bend strips in center to look like spider legs, or place crumpled small piece of foil (about 3x1/2 inch) under 3 "legs" to make them stand up in center. Brush breads with beaten egg white. Place 2 olive slices on each to look like eyes. Bake 12 to 15 minutes or until "spider body" is light golden brown and "legs" are golden brown. 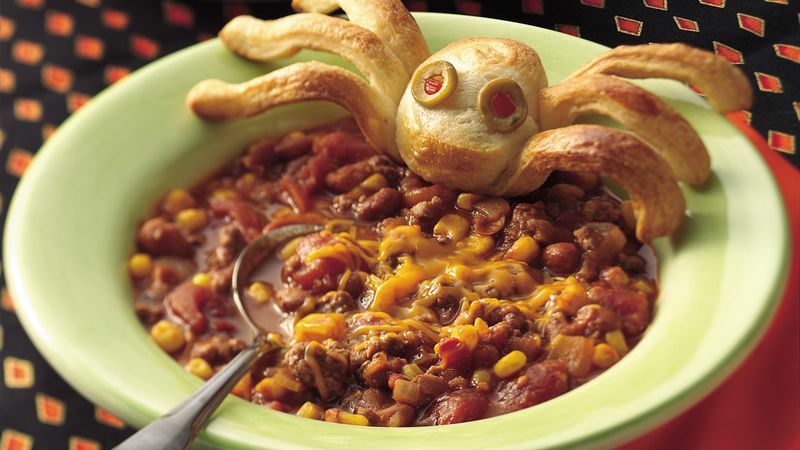 Top individual servings of chili with cheese; serve with warm spider breads. Set out small bowls of shredded cheese, sour cream and chopped onion for chili toppers.